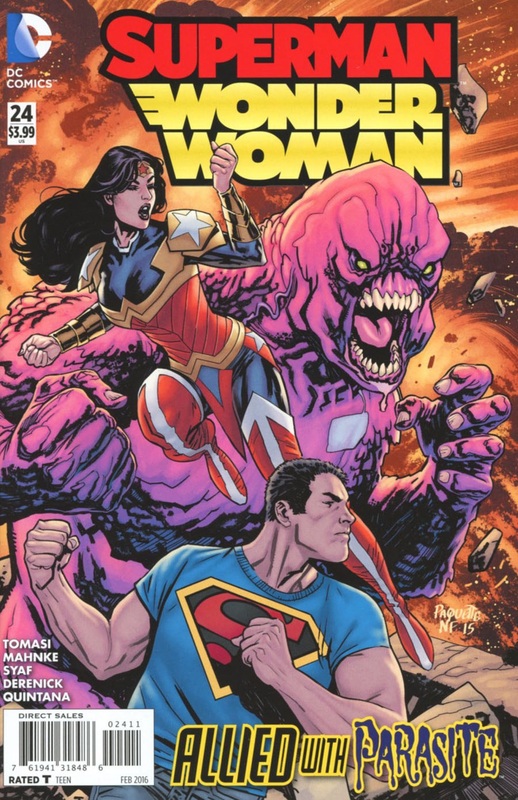 Wonder Woman struggles to fight off the control of the armor as it fights Superman. It smashes Clark repeatedly while draining Wonder Woman's abilities into Angelo Bend, while at the same time Parasite is fighting Bend's hordes of Black Hole soldiers. When Clark is finally unconscious and Parasite is overfilled with power to the point he is sick, Bend reveals he is planning to overthrow his father by using a trapped Firestorm and a store of superpowers to supercharge him until he surpasses his parent. As Angelo Bend climbs into an absorbing suit Wonder Woman tries to wake Clark who after his beating seems to be wallowing in self pity. Wonder Woman angrily yells at him until he wakes up, and with Parasite in hand, leaps into the amniotic pool that Bend is powering up within. Clark and Parasite throw themselves into Bend and the overload of both of them and Firestorm's charge literally cause Bend to explode with power. Wonder Woman is able to pull out of the absorbing armor and uses her lasso to capture all the super-villains. She urges Clark to grab Parasite and Firestorm before the underground base implodes. Luckily everyone escapes, even Bend. Parasite is now a husk and is angry that Clark has backed out of their deal. Clark points out that neither party truly trusted that the other would honestly fulfill the terms of their agreement. Firestorm is taken to recuperate and the villains are all returned to Belle Reve and Blackgate. Later Bend, in solitary confinement, is visited by his father, Vandal Savage. Savage gives Angelo one last chance to be at his side but Bend refuses. A now enraged Vandal forces his hand down his son's throat and tears out his heart. To Be Continued in Superman Annual #3 - 'Savage Dawn'. Story - 4: There isn't much to this chapter of the story save for tying up the loose ends. As with other misdirections in the 'Truth' story it is wholly irrelevant, especially once fleshed out. It was however a very good read that shone more of a light on the dynamic between Diana and Clark than as a genuine part of 'Truth'. Story progression was delivered in the tenuous cameo by Vandal but as I have already mentioned it was still a very good read. "Power or no power... You're still Superman, Damn it!" Art - 4: Despite a plethora of inkers lending a hand to produce the art over Manke & Syaf's layouts with the action being literally non-stop it actually proves to be a very well-matched marriage of talents. What could have been an artistic disaster was actually a brilliantly illustrated issue.